Richardson, Texas (September 15, 2011) – The Hive Group, the world’s leading provider of treemap interfaces, today announces the combined release of Honeycomb Studio 5.9 and Honeycomb Rich 5.9. 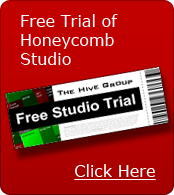 Honeycomb Studio is the managed environment for developing, deploying and maintaining enterprise treemap implementations; while Honeycomb Rich enables customized deployments with advanced controls and feature sets. The combined release of these complementary environments brings new functionality for all types of users: end users, technical developers, and administrators. The features and capabilities of both Honeycomb Studio and Honeycomb Rich are expanded; and importantly, the integration between the two means the power of the Rich environment is more accessible to non-technical users. Studio, with its wizard-based design interface, allows users to immediately begin building treemaps, and walks users through the creation process step-by-step. Popular functionality like “state management” (previously only available in Honeycomb Rich) is now available in Honeycomb Studio. Users may capture combinations of control settings and filters as defined “states” -- in order to quickly access frequently used view settings. States can be shared among users or can be unique to an individual. Studio includes an administrative module for end-user management and tightly-controlled access through integrated security roles. New functionality around constraining views (including dynamic security awareness in auto-generated filters) improves the capability for developing highly targeted interfaces, and allows a publisher to focus the analysis with restricted data and/or controls -- while still adhering to each end user’s specific security profile. The Honeycomb 5.9 combined release now supports image export functionality from Honeycomb Rich in the most popular image formats including PNG, SVG, and PDF. This functionality allows scalable print-quality treemaps of any size. Importantly, the same generation engine now underlies both the Studio and the Rich environments -- offering an improved “export to Rich” option that now adopts familiar attribute-naming conventions in the exported view. “Studio implementations can be seamlessly extended to leverage all the functionality and customization that Honeycomb Rich offers,” commented Dan Struebel, Director of Strategic Accounts at The Hive Group. “Our customers and partners are very enthusiastic about this release,” he added. CFA Institute is the global, not-for-profit association of investment professionals that awards the CFA and CIPM designations. As a customer of The Hive Group, CFA Institute uses Honeycomb to analyze market intelligence. “The Hive Group's Honeycomb software represents an important opportunity to leverage visual analysis as an operational tool. The Hive Group is known for customer responsiveness; and with Honeycomb 5.9, they continue to introduce functionality that meets the ever-broadening ways that organizations use their software,” said Melissa Looney, Manager of Market Intelligence at CFA Institute. The Hive Group develops business visualization software. Customers include major manufacturers, financial services organizations, logistics companies, retailers, natural resources companies, many government agencies, and military branches. These organizations use the software to build visual interfaces for routine operational and financial analysis. The company’s interfaces are used to analyze performance, manage assets, identify anomalies and trends, assess risk and compliance issues, and more. The company’s treemapping software, Honeycomb, is the foundation of these visual environments, and has been commercially available for over ten years.